Day one of seven – Only 256km to go! You’re fit, motivated and starting to become serious about endurance running. You’re preparing for your first (ultra)marathon, especially the Marathon des Sables (MDS). You’re rehabilitating from a running injury. 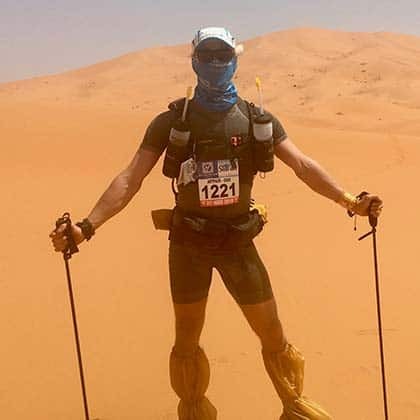 A couple of years ago I was asked by a friend if I wanted to run the Marathon des Sables (MDS). We had 10 months to prepare. Neither of us were anything close to what you might call “endurance runners”. Personally I’d never run much more than 5km in one stretch in my life. In the end four of us went along with his crazy scheme, raising ~£30,000 for charity in the process. Two of us finished in the top 250 (of 1,200). My friend and I placed in the mid pack (~600). That was despite him breaking both his little toes, losing eight toe nails and having half the skin on his feet sanded off by the Sahara (the photos are gruesome!). Looking back, the training and race were one of the most challenging and rewarding experiences I’ve ever had. One of the first things I did was to buy as many books on endurance running as I could. I then synthesised the best of these into a set of notes (below) which informed my training plan. Looking back on the experience I’m incredibly glad I did this. Our timeline from fairly fit to MDS worthy was short and the notes helped avoid most major “new runner” pitfalls. At one point I did pick up a knee injury. Thanks to my research I was able to get back up and running as quickly as possible without major complications. To keep the notes below concise I’ve stripped out the extra detail on preparing specifically for the MDS. I might break these down in a future post. For now, here’s my raw MDS training plan, kit list and nutrition plan. What’s left below is hopefully a useful starting point for general endurance running / ultra marathon training! Where a section lacks detail I’d recommend referring to the books below or a Google search. This is probably because that section gets very detailed (e.g., fixing your feet), academic (e.g., training periodicity) or controversial (e..g., nutrition). In those cases I’ve tried to link to a good resource that wraps up the main points well. I was never a runner before training for the MDS but it’s now an important part of my life. Running keeps me fit whilst I’m on the road and is an amazing way to explore new places and meet new people. As a keystone habit it’s also been incredibly powerful for bringing about far reaching positive change to my life. Good luck with your training and if you have any hints/tips/opinions then please do leave a comment! “Born to Run” – Chris McDougall – From the African Savannah, to the Mexican Copper Canyons and Nike’s factories – Chris takes running back to basics in his critically acclaimed book on evolution, injury and recovery. Compelling insights, great story telling and practical insights abound. A must read. “Eat and Run” – Scott Jurek – If you’re going to take advice from anyone you could do worse than the most well-known and successful ultra marathon athlete of our time. Scott’s proof that veganism is compatible with world class athleticism alone would make this book a must. Definitely one to read and refer to. “Field Guide to Ultra Running” – Hal Koerner – Hal dispenses with story telling in favour of a wealth of practical, down-to-earth tips on endurance running. This essential endurance running guide is full of trail running techniques, race strategies and even detailed training plans for 50km or 50 and 100 mile ultras. One of the most helpful books I read. “The Art of Running Faster” – Julian Goater – A fantastic running primer, especially on the bigger picture elements of running (e.g., mindset and training cycles). Julian’s book is a superb supplement to Hal’s guide with a slightly more track focussed and academic flavour. “Survival of the Fittest” – Mike Stroud – I didn’t read this book before the MDS but wish I had. Full of anecdotes from the author’s own experiences and some great insights into Nutrition, Evolution and Physiology. If you’re still hungry after McDougall and Jurek then this book is definitely worth picking up. “Fixing your Feet” – John Vonhof – If endurance running is your trade then your feet are your tools. Nowhere will you find a book that covers the topic so comprehensively. Perfect for you if you’ve ever had a hot-spot, blister or toe-nail trouble. If you haven’t, you will. This bible on foot care will save you a world of pain! Anyone training specifically for the MDS might also enjoy “Running from Shadows” by Mark Roe. A humorous and well written account of one office warrior’s experience training for and completing the race. This Discovery Channel documentary featuring Olympic rowing gold medallist James Cracknell also made for part inspiring, part terrifying pre-race viewing. The Runner’s World website is a treasure trove of high quality writing on all things running. No matter what I type into Google on the subject it usually comes up top of the results. Well worth checking out. Sculpt your practice into a long-term plan. 1. Bring the Right Mindset. 50% of endurance running is in your head. That’s why, when it comes to running, mental toughness is as important as physical fitness. Decide to love it not to fight it. Keep training fun (don’t over fixate on performance). Periodically run without gadgets and goals. Expect the unexpected both in training and on the race. Relish each setback as an opportunity for learning and growth. It’s not the goal, it’s how you get there. Share your running highs and lows with friends and supporters. Give back; run for charity, help other runners. It is amazing what the body can withstand and achieve with small, steady, compounding improvements. That is why the Golden Rule of becoming a better runner is not getting injured. The majority of injuries are avoidable. Don’t overcompensate coming back into your plan. The pressure of catching up on missed training is powerful. Do not succumb to it. Injury cycles can last for months or even years. Once you slip in, it can be very hard to escape. Know your enemy (see APPENDIX: Running Injuries). Learn the causes, early symptoms, preventative measures and treatments of common complaints. This will help you catch them early and prevent setbacks. Be patient with your training. Overtraining leads to mental and physical fatigue. Fatigue will wear you down and compromise your form. Never train so hard that you lose form (this exacerbates overtraining and causes most injuries). Poor technique is at the heart of many chronic injuries. Over striding and heal striking are the worst offenders. Remember that the first and most important goal of every training session is completing the next session. For a great primer on technique, check out this timeless 4 minute classic from ultra marathon legend Scott Jurek. Speed (distance per minute) = cadence (steps per minute) x stride length (distance per step). First, focus on high cadence and light feet. This will help you avoid injury and increase efficiency. Then, adjust stride length (without compromising cadence) to control speed. Use a fast cadence (180 strikes per minute). I use a free metronome app on my phone set to 180 bpm to help with this. It may feel uncomfortably quick at first but will quickly became natural. Land on mid/front of the foot. The key here is to avoid heal striking – a major cause of knee and back injury. Land lightly (listen to your feet). Strike below or behind your hips. Otherwise you’re heal striking and wasting energy coming over your foot. Look at the ground ~5 yards out. Bend your arms 45-90 degrees. Do not cross your body with your arms. Think of an efficient cycling movement. Lift your knees to pull you forward. Flick your heels back to push you forward. Arms are integral to shifting bodyweight quickly. Cadence is often limited by arms rather than legs. Feel shoulders (not elbows) pulling back and down one at a time (but keep them relaxed). Breathe easily, no need for gasping. Reduces heart-rate and perceived stress. If you can’t breathe through your nose you may be running too hard. Set a consistent rhythm (breathe in for 3 + steps, out for 3 + steps). Practice using your whole lungs (be mindful to avoid shallow breathing). REMEMBER: The golden rule of training is to be able to complete the next training session. Give each training session a clear focal point. Good running requires training in ALL of these skills (even/especially for endurance). Focus on honing one skill per training session (six Ss). How and when to focus on each S will make more sense after section 5. Train twice a day on non-long run days. Provides twice the training focal points. Vary the conditions you train in. Variable surfaces will build ankle strength and reduce the risk of injury. Be careful of road cambers, they can skew technique and cause injury. Get used to running in the wind, rain, snow, heat, cold, humidity. Learn to relax into and embrace adverse conditions, not fight them. Run at dawn, mid-day, dusk and night time. The unique challenges of each will help generalise your conditioning. Using a variety of training techniques each week. These should form the bulk of running sessions. Run at 60 – 70% (enough to carry a conversation) without checking a watch or worrying about pace. Treat these as a good opportunity to experiment (with terrain, mileage, running partners). You may feel easy runs are “junk miles” but they add to the foundation and build strength and muscle memory. Weekly mileage is the best predictor of race performance. Finish with Strides (100m bursts of 95% speed with 2 min cool down, sets of 4 – 12). 30 (- 50% if racing back to back marathons) of your weekly mileage. Use these to experiment with race nutrition and gear. Careful not to increase by more than 10% per week. e.g., fartleks, tempos, intervals, hills, barefoot, spectrum and resistance training. Include a few each week to stress a particular focal point. * I found aiming for a heart rate of ~ 160 BPM worked well for me when running without a partner. Core strength (esp. stomach and back) is key to running. Go to the gym and train regularly on top of your running. Aim for 200 crunches every morning in addition to your gym sessions. Suppleness increases range of motion and efficiency as well as reducing risk of chronic injuries. Best performed consistently; before and/or after and separately (e.g., Yoga) to training. 5. Sculpt Your Practice Into a Long-term Plan. Sign up for a race, whether competitive or fun. Races are a great way to structure your training. Have fun with it, pick a race that will take you to new places and people. Always remember that the race is a training aid and not an end in itself. Set multiple goals for the race. Choose a target pace / time based on previous results. Set A, B and C goals (e.g., top 100, personal best, finish race). This will help you adapt your plan to reality leading up to / on race. Train specifically for your race. Know the course and its demands. Type of running (back-to-backs vs. long runs). Conditions (temperature, time of day, surface, hills). Hydration approach (and limitations e.g., rationing). Replicate these demands as much as possible in training. Sign up for Practice / Milestone Races. Sign up for milestone races e.g., one third and two thirds of the way to your main race. Gives you an indicator of progress. Creates realistic conditions to test your gear, nutrition and hydration. Periodisation is about structuring your long-term training plan to maximise fitness. There are many different opinions on “best” practice and it can get pretty academic pretty quickly. Experiment with what works best for you, do some research, ask other runners or join a running club. Base (~8 weeks) – Take it easy, focus on easy and long runs. Specificity (~6 weeks) – Start brining in some Special Training Sessions to focus on eg., endurance, speed and recovery. Peak (~2 weeks) – Ramp up and push the boundaries of over-training. This shouldn’t feel sustainable but don’t get injured! Taper (~2 weeks) – Cut training down to almost nothing. Stretch, do some acclimatisation. Race – The big day(s). Don’t forget to stick to your plan! Recover (~4 weeks+) – Very light training. Why not try e.g., swimming. You can take things even further by periodising within your macro periods. E.g., run harder than the period average for 3 weeks then take it easier for 1 week. This can help keep your sessions varied, speed up gains and avoid fatigue. 6. Fuel yourself for success. Caveat: Do not overthink general nutrition. It is the quickest way to make your life and running habit miserable. A little education goes a long way and you will find yourself naturally changing your diet as your running progresses. Be wary of general rules: nutrition is highly individual. Experiment. Have fun. And trust your body. Get enough of the right calories. Subjects like sports nutrition, body types and basic metabolic rates are a Pandora’s box I’m not going to open here. To begin with, just listen to your body and try and aim for enough calories from a wide variety of foods. In the meantime, give yourself a basic crash course in nutrition via Google / some of the links in this section. Next focus on tuning your diet towards more of the “right” calories. Whatever that means for you. These nutrition basics articles on Runner’s World are a good starting point. To meat or not to meat (open for debate). This is a highly personal choice – experiment on your training runs and mix up flavors to avoid monotony. For carbs, aim for 300 – 400 calories an hour. For salts, aim for 200mg (easy conditions) to 400mg (tough conditions) per hour. Use a watch to monitor your caloric intake closely and don’t get behind. Once dehydrated it is very hard to catch up. Severe dehydration can lead to Hypertonia as the kidneys shut down. Aim for 600ml per hour (20 – 40 sips @ 15 – 30ml per sip) in easy conditions and much more in harsh conditions. Use a watch to keep to a strict drinking regimen. 8. Use the right tools. Very personal. I’m a Brooks Cascadia (designed by Scott Jurek) fan but each to their own! Use the Taco test to check if your current shoes are compromised: if you can bend the forefoot past 90 degrees it’s time for a new pair! Don’t skimp, go to a specialist running shop. Avoid too much support (this can weaken your foot). Think about trail shoes vs. trainers (some trail shoes have self cleaning soles). Wear shoes that allow you to run down hill without jamming your toe. Anticipate foot swelling of at least half a size. I always run with an inner layer of Injinji toe socks and have (so far) never had a blister. Blister management = moisture management. You get what you pay for, avoid cottons (terrible wicking). After contact with water, change socks or use a hairdryer at next aid station. Very personal choice. I’m a huge fan of Suunto’s Ambit Peak range. Critical for timing nutrition, hydration. Also important for sticking to planned pace. Cover up in light clothing / colours. N.B., Wearing less is not always the best option for staying cool. Wear this around your waist. Keeps it stable allowing head movement. Also lowers angle increasing depth perception. Is good but make sure you can still hear what (and who) is going on around you. In early stages of training it can be helpful to hear your feet to make sure they stay light. Many different styles and varieties available. Practice with your bottles before a race to check for leaks / customisations. If endurance running is your trade then your feet are your tools. Look after them and they will look after you. Failing to do so will result in catastrophic blisters, toe nail loss and injury causing alterations in technique. Invest in high quality footwear. Check the lining often for snags and bumps. Replace it as often as required. Learn some basic alternative lacing techniques. Experiment with types and layers of socks. The best way to get your feet used to endurance running…. …is to spend lots of time on your feet. Keep your nails short and trim. Keep your feet smooth and callus free. Consider using foot toughening treatments. Identify problem areas for your feet during training / milestone races. Learn how to tape those areas in advance. Never try to run through a hot-spot – it will become a blister. Much better to lose 5 minutes than drop out of a race entirely. Replace wet socks with dry ones as soon as possible. Bandaging – learn the basics of treating blisters. Runners knee – irritation at / around where the kneecap (patella) rests on the thighbone. Achilles tendinitis – dull or sharp pain along the back of the tendon, usually close to the heel. Plantar Fasciitis – a sharp stab or deep ache in the middle of the heel or along the arch of the foot. Shin Splints – diffuse pain in the lower part of your shins. Iliotibial Band Syndrome (ITBS) – swelling and pain on the outside of the knee. Stress Fractures – a specific point of acute pain on a bone (usually lower leg or foot). Demotivation / depression are common symptoms of mental fatigue. Sleep / rest. Have fun and check your mindset hasn’t become overly performance focussed. If all else fails, take a break from formal training and / or running entirely! An abnormally elevated resting heart rate is a dead give away for physical fatigue or illness. Be mindful of overtraining and make sure you’re getting enough sleep, rest and food. Pushing yourself too hard when you’re physically fatigued is a sure route to injury. Stress-free workout that improves mind-body awareness, mental strength, and stamina. Hill Repeats: 2 – 3 minutes uphill running at an all out effort. Repeat 3 – 12 times depending on the workout. Practice both up and down hill running but only one at a time. If no hills, use a treadmill (better than nothing!). Uphills make you run properly (front strike, arms moving) so note the feeling on them. Practice running strongly off the top of a hill to leave other racers behind. Don’t eat during a climb (while heart rate elevated), eat at the top, you will need the energy for the descent. A good downhill is harder to master than a good uphill. Find a line and look where you want to go (5 meters ahead). Keep gravity over the centre and let gravity do the work. Keep cadence fast and land on your mid-foot. Use a duck stance if the descent is technical to avoid lateral ankle roles and increase stability. Maintain breathing and stay relaxed. Use sunglasses/a visor to help stop air get into your eyes. Spread arms wide like an airplane for balance. Increases lactate threshold to run faster at easier effort levels. Improves focus, race simulation, and mental strength. If you can talk easily, you’re not in the tempo zone, and if you can’t talk at all, you’re above the zone. Improved running form and economy, endurance, mind-body coordination, motivation, and fat-burning. See e.g., structured speed training, progression runs and negative splits. Short, intense work outs followed by an equal or slightly longer recovery e.g., two minutes hard, two – three minutes recovery. Unlike tempo workouts, you’re running above your red line and at an effort where you are reaching hard for air and counting the seconds until you can stop. The secret is in the recovery. Patience and discipline while you’re running easy allows you to run the next interval strong and finish the entire workout fatigued but not completely spent. Modern trainers can weaken the foot by providing too much support (leading to injury). Progressive and occasional barefoot running is good to strengthen feet. Start with 5 – 10 mins then work slowly up to 30 – 45 mins. Choose a soft surface e.g., grass. Helps to push you out of your comfort zone and discover new things (esp. in absence of a coach). Strike as far forward on your foot as you can for 2 mins. Run as fast as you can for 2 mins. Increase cadence to max possible for 2 mins.